Good morning (well, Pacific Time)! 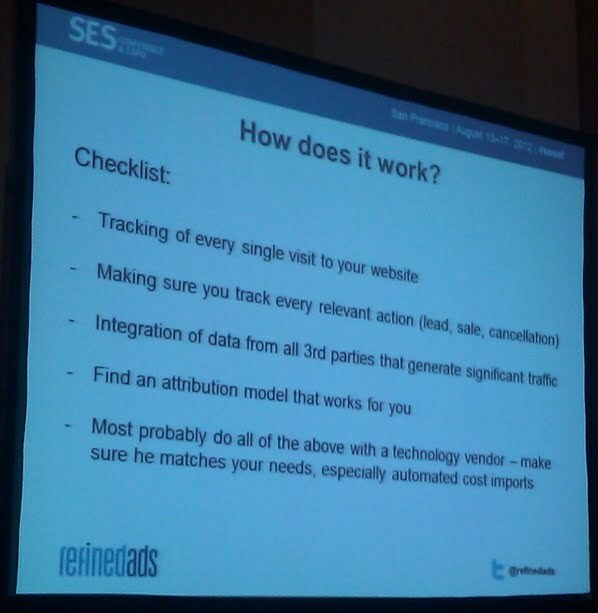 This session is going to tackle attribution modeling and how channels work together for conversions. Here, we have Thomas Bindl (@RefinedAds) and Jamie Smith (@EngineReadyCEO) who are going to help us figure out the crazy world of multichannel attribution. First up is Jamie Smith. He is going to be focusing on Google’s tools for multichannel attribution during this presentation. What do you do with all the data in your analytics? Tactical planning happens before you analyze the data. What are the KPIs? Return on ad spend? Cost per acquisition? Have a meeting on the channels you’re using to examine what’s profitable and what’s not. Recently, Google had a webinar on multichannel attribution. Check it out if you can. Most of us know our conversion rate, but does anyone know what their call-in conversion in? Look at your site rate vs. call-in rate. Which campaigns make your phone ring? What do you do with this data? His company does a 40 percent attribution to first click, 40 percent to last click, and disperses the 20 percent between the other touch points. This is on a keyword level but you can also do this cross-channels. It’s not right or wrong is you do it differently, that’s just what they feel most comfortable with. Build maps and models around common paths. How much money did you spend in this channel, and how did it contribute to revenue? You know direct access if often the last touch point, but look at the previous. Look at the order value of people who come to your site once versus twice, three times, etc. It’s good to know this information. Next up is Thomas Bindl. 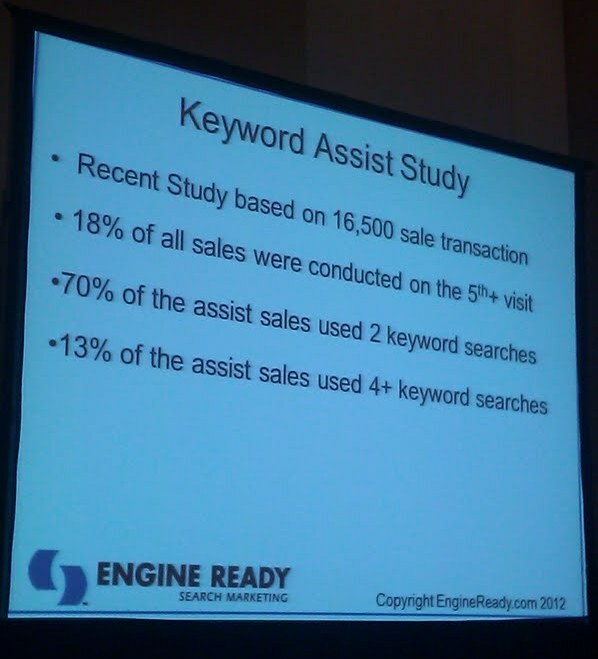 He starts by saying multiple clicks make up 50 percent of all conversions. Advantages: Attribution of sales and costs, touch points can be defined freely. U shape: First and last touch point gets the highest values. This is the one he recommends. Even distribution: Every touch points gets the same value. This is the easiest model to start with. Attributing everything is better than just attributing to the last click. What do you do with all the data? Use metrics in combination for daily optimization. Use campaign data for campaign planning regularly. Use customer journeys to understand the buying process. Refine attribution model on a quarterly basis. The future — what’s happening next? Better integration of offline data (TV beta in refined ads). Interface with existing systems (CRM, for example). Auto optimization of campaigns or parts of them. Do I really need attribution modeling? The answer is yes. This is where we are going. Act now and get an advantage.